This week sees the release of three films of diverse genres. These three films include the horror thriller 1920 LONDON, followed by the relationship drama ONE NIGHT STAND and the hard hitting film TRAFFIC that happens to be a remake of a 2011 Malayalam hit by the same name. Will the Hindi version of TRAFFIC manage to create a traffic-jam of the cinegoers at the theaters or will it see red signal the Box-Office, let's analyze. The film starts off with the narration (voiceover) of Manoj Bajpayee wherein he speaks about life in general. This is followed by the day in the life of all the leading characters of the film, which includes the tainted traffic constable Ramdas Godbole (Manoj Bajpayee), 'extremely busy' filmstar Dev Kapoor (Prosenjit Chatterjee), his wife Maya (Divya Dutta), Dr. Ahmed Ali (Sachin Khedekar) and his wife (Kitu Gidwani). An unfortunate bike accident lands up Dr. Ali's only son Rehan Ali (Vishal Singh) battling for his life in a hospital, without any hopes of survival. His parents are left with a mobile recording of their film reporter son Rehan preparing for his 'lifetime interview' with filmstar Dev Kapoor. On the other hand, Dev Kapoor's young daughter Ria gets hospitalized in Pune, as she is suffering from a rare ailment called 'Dilated Cardiomyopathy'. The only way she could be saved is by having a heart transplant done on her through a suitable donor. As luck would have it, Rehan's heart becomes the perfect match (donor) for Ria (recipient). But the problem arises in the form of distance between the two cities (Mumbai and Pune) and the time duration in which the heart needs to be transplanted. After ruling out all the possibilities of transport, it gets decided that Rehan's heart will be transported from Mumbai to Pune by road. Though initially reluctant, Mumbai Police Traffic Commissioner Gurbir Singh (Jimmy Shergill), later, undertakes the task of saving Ria's life. And the person chosen for the job is the self-motivated traffic constable Ramdas Godbole, who wants to erase the bribe's stain off his uniform. 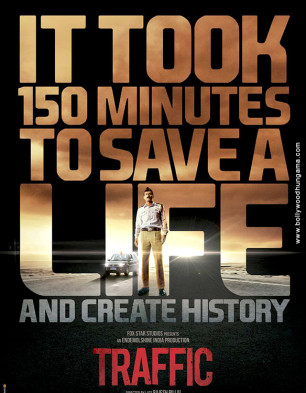 Considering all the possible roadblocks (quite literally) and the bottleneck traffic that Mumbai is subjected to everyday, does a guilt-ridden constable Godbole become successful in transporting an extremely sensitive human heart from Mumbai to Pune, or does he fail in the assigned task is what forms the main crux of the film. Even though (late) Rajesh Pillai has directed a handful of south Indian films, TRAFFIC happens to be his first Hindi film as a director. One really has to applaud him for the conviction with which he has treated the subject of heart transplant. His direction complements the film's narrative and also every character in the film. Full marks to him for the way in which he has extracted some of the amazing performances from the actors. The film's screenplay (Suresh Nair) is outstanding and its story (Bobby Sanjay) extremely believable without resorting to any over the top antics. The film's first half maybe slow in establishing the film's story, but it's the film's fast pacy second half that keeps the audience on the edge of their seats till the end. What actually plays the 'villain' in the film's narrative though are the numerous 'cinematic liberties' that the filmmaker has taken in order to establish the film. As for the performances, despite the 'script being the king', the film rides equally on the shoulders of the seasoned performer Manoj Bajpayee, Divya Dutta, Jimmy Shergill and Prosenjit Chatterjee. The conviction with which Manoj Bajpayee has handled the nuances of his character is simply outstanding, so much so that one just cannot imagine any other actor in his place. The other show stealer is Divya Dutta who simply shines in her character of a helpless mother. Jimmy Shergill, on the other hand, delivers a decent performance in his role of a Police Commissioner. Prosenjit Chatterjee does a commendable job of an 'eternally busy' superstar. While the film's music (Mithoon) is average, it's the film's background score (Nitin Ketke) that is impressive. The film's cinematography (Santhosh Thundiyil, Anil Lal) is decent. The film's editing (Nishant Radhakrishnan, Mahesh Narayanan) could have been tighter, especially in the film's first half. On the whole, TRAFFIC will appeal to very limited audiences and will have a tough run at the box-office.